The latest member of the Saxonia watch family, the automatic Saxonia Outsize Date comes with a distinctive black dial that features the date in a large size, as well as a subsidiary seconds counter. It’s available in white or pink gold. An ode to Mr Harry Winston’s favourite gemstone cut, the latest addition to the Emerald Collection comes in a dainty gold case set with diamonds and double tour satin strap. Issued in a limited edition of 1,000 pieces, the Polaris Memovox features the special alarm function made famous by the 1968 version of the watch. This 50th-anniversary edition features the striking mechanism with a gong, along with an instant-jump date-change system. The Classique Tourbillon Extra-Plat Automatique 5367 provides a beautifully simple interpretation of the tourbillon on a minimalist enamel dial. Functional and stylish, the Senator Cosmopolite displays two time zones on its well-organised dial. At its heart is an automatic movement that offers up to 72 hours of power reserve. The B01 is the latest addition to the aviation-inspired Navitimer 8 series. 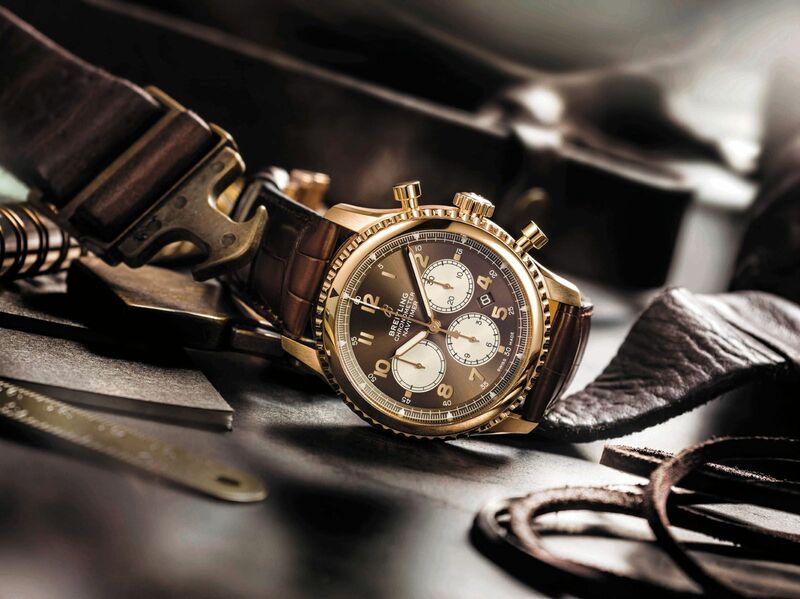 The B01 Chronograph 43 comes in red gold or steel. The Swiss watchmaker celebrates its 150th anniversary with this handsome Portugieser Chronograph Edition “150 Years”, which for the first time features an IWC-manufactured movement from the 69000 calibre family. The brand has celebrated four decades of the Ladies Royal Oak with a special “Frosted Gold” range for women, featuring an ancient Florentine gold hammering technique on the case and bracelet. Pictured here is the stunning selfwinding Royal Oak Frosted Gold Caroline Bucci Limited Edition piece. The much-improved Seamaster Diver 300M features a larger 42mm gold and stainless steel case and a redesigned diving bezel, which now comes in ceramic and Ceragold for increased durability. Only 2018 pieces of the Big Bang Referee 2018 Fifa World Cup Russia collectible watch were produced, so finding one would be like scoring a goal. This smart watch features a 35.4mm Amoled screen and microphone, GPS and gyroscope functions, all encased in lightweight titanium. Svelte and with a bit of sparkle, the Possession 29mm ladies watch comes in stainless steel with a dark blue interchangeable alligator strap. It boasts a silver dial that features diamond indexes. the watch showcases a DLC-coated, skeletonised dial framed in beige gold. A watch for all occasions, Chaumet’s new Liens Lumière features an elegant bezel in gold, rose gold or silver. There are alligator straps available in 12 colours and the mother-of-pearl dial adds a classy and radiant quality to the timepiece. The Tambour Horizon connected watch continues to evolve. It is now available in four versions and a collection of interchangeable straps. The latest addition in functionality is a travel-inspired game that unlocks new, exclusive dials as players move up levels.